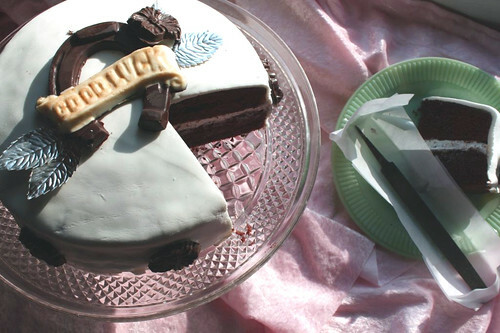 We all need to make a stealthy exit sometimes--so why not add some gateau to your getaway with a super-sweet cake complete with prison-break nail file from Criminal Crafts? These two-layer cakes are indeed edible, and come in a variety of cake and frosting combinations; they are coated in apricot glaze before shipping to preserve freshness; each cake has a (non-edible) durable 6" metal file (safely wrapped in a parchment paper seal) hidden in the lower layer. Of course, as they specify in their shop, "We’ve never actually tried to make a jail break with one, but seen it done in movies, so we’re fairly certain it should work" -- though refunds are not offered in case it doesn't. This item is for delivery in the US only and will NOT be shipped directly to prisons, mental health facilities, government offices or HS detention, you’re just going to have to take it in person, and as we’ve spelled it out in delicious dark chocolate, “Good Luck”. As a special offer we’re offering a 20% discount to anyone ordering who is under investigation for tax fraud or if your last name is Madoff. Please convo for more info on felony specials. Sounds like one sweet escape! CakeSpy Note: The artist in question, Shawn Bowman, is also part of an amazing upcoming event in Portland, OR: The Pie Fight Party! Click here for more information.